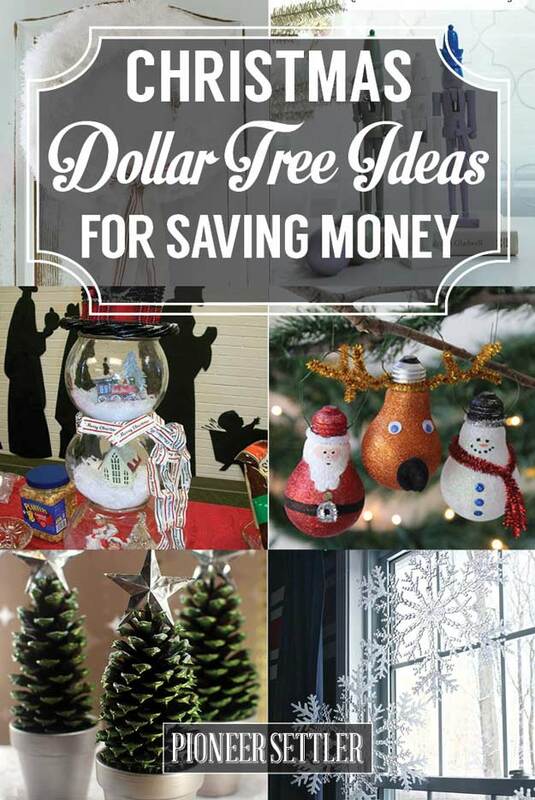 In need of some Christmas dollar tree ideas for saving money this holiday season? If you want to make your home look fantastic without breaking the bank, then try these ideas! Christmas is the most colorful time of the year in my opinion. Everyone just decorates their home and do their best to make the surrounding merry and cheerful. To do that, you need to have a budget. But one thing I discovered as a homesteader is that you don’t always have to spend a fortune to make your Christmas special. Sometimes, all you need is a trip to Dollar Tree! Give new color to the traditional nutcrackers with this DIY tutorial. When you want to teach your kids a thing or two about Christmas decorations, you can try asking them to follow these instructions. Bring joy to your home with these dollar tree plates. Check it out here. Washi tape is all you need to decorate your dollar tree cones. Even kids can do it. See it here. Here’s a great way of repurposing dusters. Get the tutorial here. One is the number that you need to remember for this dollar store craft. See how you can make it here. Here’s a last minute decor project you can make in a budget. Get the steps here. They don’t really look that they came from the dollar tree store do they? Greet family and friends with a happy gingerbread man. You’ll just need some cookie sheets and pizza pans. See how here. Super easy and cute. Who ever said snowmen always have to be made of snow? Check it out here. Bring some joy to your home with a few items from the Dollar Tree. Get the tutorial here. Want to make something amazing? Try this DIY wreath from Christmas balls from the Dollar store. Just follow the infographic! Everything looks better in a jar, even a village! See how you can make it here. Make a Christmas decor by spending little to nothing at all. See what you need here. The name says it all, easy peasy! Get convinced with this DIY tutorial. Create a personalized ornament that’s just sooo adorable. Check it out and even place your order here. It comes in white but if you have some painting skills, or just want to try painting, you can pull this off. See how here. Kitchen towels can also be… angelic. Just watch the video tutorial. Wreaths don’t always have to be round, sometimes, it can also take the form of a candy cane. Get the steps here. Can’t get enough of all things Dollar Tree? Check out SparkleOnForever’s Dollar Tree Christmas Haul, I’m envious! What do you think of these Christmas Dollar Tree ideas? Let us know in the comments section what your thoughts are on these Christmas crafts. Which one will you try? Let us know how it went and share your experience with us in the comment section below.